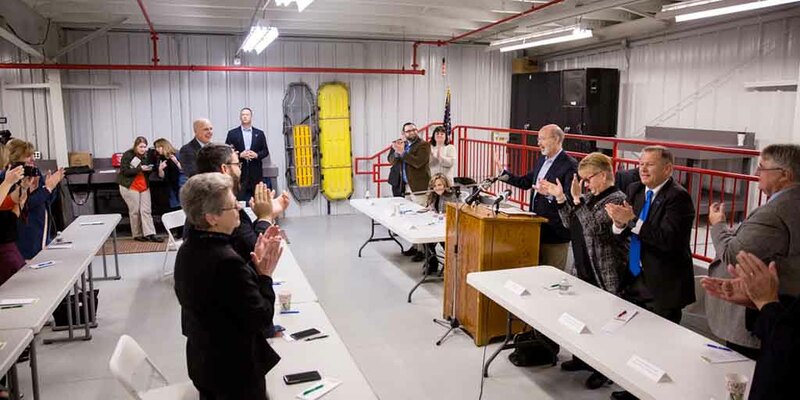 Prosperity, PA – Today, Governor Tom Wolf was joined by Senator Camera Bartolotta and Representative Pam Snyder to announce $3 million in funding to repurpose the existing training facilities of United Mine Workers of America Career Centers’ (UMWACC) to provide broader retraining for dislocated workers focused on high priority occupations. The Redevelopment Capital Assistance Program (RACP) funds will be used to repurpose the UMWACC existing training facilities including the construction of a new Commercial Driver’s License (CDL) pad, along with a diesel building addition, and roof repairs to the existing facility. The funding will support UMWACC’s efforts to provide broader retraining for dislocated workers to get them back to work by will collaborating with area technical centers and community colleges to connect dislocated workers with training that will prepare them for occupations such as those requiring a Commercial Driver’s License (CDL), as well as advanced manufacturing and cybersecurity. The project will include several phases beginning with the dismantling of the 40,000 square-foot simulated coal mine and renovations to include a new concrete floor, classroom space, computer labs, restrooms, and a study/lounge area. At the same time, and in order to support the CDL program, UMWACC will demolish and remove the tin smoke mine located on the lower property to prepare the site for the CDL pad. It is estimated that during the initial phase approximately 400 workers will be trained, with no less than 85 percent placed in family-sustaining employment. The United Mine Workers of America Career Centers, Inc. (UMWACC), was established under the United Mine Workers of American (UMWA) in 1996 to service dislocated workers. The UMWA Career Centers, Inc. has provided comprehensive job training and placement services to more than 6,807 dislocated miners in Pennsylvania and West Virginia. Of the 6,807 dislocated miners enrolled in UMWA Career Centers, Inc. programs, more than 4,480 of them received training and 4,342 of them returned to the workforce in jobs earning an average wage of $18.74 plus benefits.